The coffee bean plant (coffee tree) or shrub is a tropical evergreen plant which originated in Arabia, but now flourishes in the tropical belt girdling the earth between 25 degrees north and 30 degrees south of the equator. It is a remarkable plant as it is possible to find blossom, green cherries and ripe cherries flourishing at the same time together. There are three main varieties of coffee accepted as commercial coffees though there are many hundreds of sub-varieties grown worldwide. Coffea Arabica is the most widely grown. It is usually "high grown" on mountain slopes and requires a heavy rainfall. Coffea Arabica can be found in Central and South America, in Africa, in Ethiopia and also in India and Indonesia usually between 1,000 and 2,000 metres. 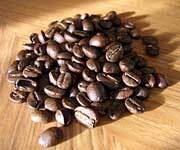 Robusta Coffee as the name implies, is a more hardy species and is found growing from sea level to 1,000 metres. It can manage with less rainfall. Indigenious to West Africa it now grows in East and Central Africa as well and also in South East Asia. Small quantities are grown in some South American countries. Robusta Coffee is used widely in the processing of instant coffee and is also an important element in many blends. This is the least important of the three main varieties. It is hardy and resists disease well but cannot tolerate drought or neglect. Indigenous to Liberia, it also grows in the Ivory Coast, in Equatorial Africa and the Cameroons. The quantity of coffee produced from these species is in fact negligible. The coffee tree takes from between three to five years to produce fruit. The coffee berries are dark green at first. They then change to yellow and, over a period of six months, ripen to deep red cherries. The skin of the coffee cherry is covered with a sweet pulp with has two coffee seeds or beans inside. The beans are covered with a husk of parchment. Under this is a delicate semi-transparent silver skin. Sometimes there is only one seed; this is known as a pea berry. The harvesting of the coffee beans varies slightly from country to country, and from plantation to plantation. It is always labour intensive and can be a very painstaking business. Men, women and sometimes children will walk between the rows of trees with baskets or bags slung over their shoulders, picking only the ripe cherries and often having to come back again and again to the same tree. Harvesting by machine is still quite rare and is mostly used by the world's largest producer, Brazil. In some countries, the fruit is allowed to ripen on the trees until it falls naturally or can be shaken onto a cloth spread on the ground. The cherries are then collected and sifted or aerated to remove the dust, leaves and twigs. 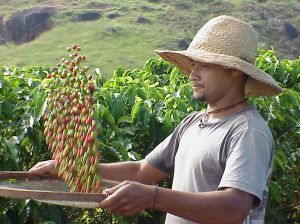 An experienced coffee taster can tell by the taste of the coffee in the cup when this method of harvesting has taken place. Some plantations in India harvest by this method. There are two methods of preparing or "curing" the coffee beans. Better quality coffee is prepared by the "wet" method. The older "dry" method is simpler and requires less expensive machinery. The wet method, using a machine called a pulper removes the pulp of the ripe cherries and exposes the inner protective coat of parchment. The coffee beans are then soaked in tanks and fermented to loosen their covering. This is washed away in fresh water until the beans are quite clean. They are then dried in the sun or by machine and are finally put into a huller, which removes the parchment and silver skin. Once the silver skin has been removed, the "polished" coffee is ready to be sorted and graded by size. Finally the green beans are packed into 60-kilogram bags for shipping around the world. Using the dry method, the fresh cherries are spread in thin layers on mats or drying grounds. They are raked and turned frequently so that they will dry evenly in the sun. This may take two weeks or even longer. Once they are dry, the cherries are put through special hullers. These remove the dried pulp, the parchment shell and the silver skinds covering the beans.